My grandmother Marie Marcelle FOURNELLE married Nicolas WILDINGER, a German whose family had been living in Luxembourg since the first World War, on the 26th of July 1935. 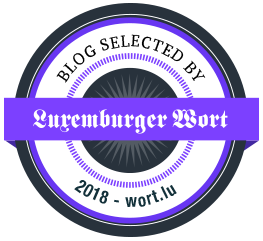 A month later she made a declaration to preserve her Luxembourgish nationality. In May 1936 her only child was born. When her daughter was five years old Marcelle’s husband died of tuberculosis. She had at least one offer of marriage but remained a widow from 1941 until her death in 2005 at the age of 95 years, 7 months, 10 days. Bomi, as her grandchildren called her, was a fearless female during World War II (1939-1945). On May 10th, 1940, the German Wehrmacht invaded Luxembourg. On the eve of this invasion the Prime Minister of Luxembourg and his government decided to go into exile. From abroad, they lead the resistance against the Nazi regime in Luxembourg. Grand Duchess Charlotte followed the government and eventually moved to London, the headquarters of the allies. Thanks to her, the resistance movement in Luxembourg developed strongly. The people of Luxembourg had their own ways to resist the German occupation of their country during World War II. They used passive resistance. They refused to speak German and participated in the Spéngelskrich or the “War of the Pins.” The people wore badges, pinned to their coats or jackets, which bore patriotic emblems such as the Red Lion or the head of Grand Duchess Charlotte, cut from a coin. 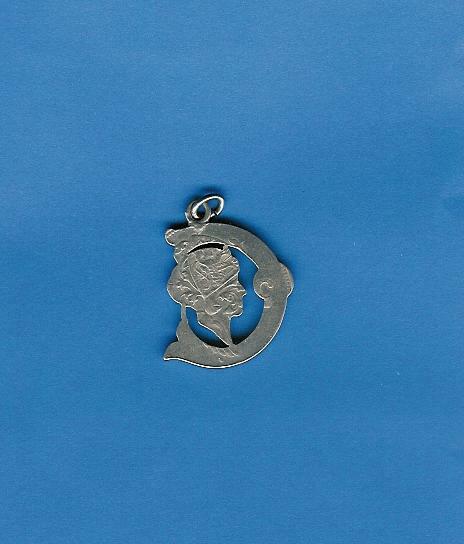 My Bomi, Marie Marcelle FOURNELLE, wore this amulette, a profile of the Grand Duchesse with the initial C for Charlotte, on a chain around her neck until her death in 2005. This family heirloom is now in the possession of my mother. This post was adapted from a previous post. 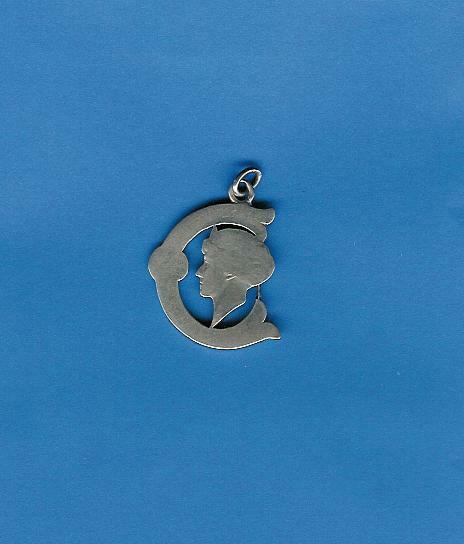 After publishing it in March 2014 I learned Bomi owned several of these and gave one to her oldest great-granddaughter C. who did not know there was a story behind the amulette she owned until she read my post. This is one of the reasons this series of posts on family heirlooms is being written – to tell the stories surrounding the treasures. Bomi told us several stories about her life during this time. Once on the evening of January 23rd all of the neighbors met in her house to celebrate the birthday of Grand Duchess Charlotte. The windows were covered so that no light could be seen from the street but the German patrol could hear the celebrating. They knocked on the door and asked what was going on. Bomi told them they were celebrating her birthday. It’s a good thing they didn’t check her identification as her birthday was June 17th. She asked the Germans to join them in a glass of wine. She would laugh when she told us how the Germans raised their glasses to the birthday girl, not knowing that they were toasting the Grand Duchess. Amy Johnson Crow’s 52 Ancestors in 52 Weeks theme for 2015 Week 24 was Heirlooms. Visit her 52 Ancestors Challenge 2015: Week 24 Recap for the links to posts in the comments. What a great story for that little amulette – and now the story is preserved for all to know. Thank you Jeanne. Since tomorrow is Veteran’s Day I wanted to do an heirloom with memories from wartime. I’d shared it in the early days of blogging. Wonderful post, Cathy! I liked the story of the celebration of your grandmother’s “birthday party”, she indeed was very courageous! Thanks for the mention! Thank you Karen. By mentioning the other bloggers who are also writing about their heirlooms I hope more will follow suit. You’re welcome! Such a wonderful story. I’m giggling at the thought of the Germans toasting the Grand Duchess, but on the other hand, it took great courage for people to wear those necklaces. And thanks for listing a couple of my heirloom posts. You’re welcome Vera Marie. I’ve always wanted to ask if you go my the first or both names. Thank you! 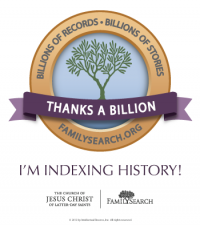 Next Next post: The New FamilySearch – I’m loving it!